Well work has been quiet this week so I managed to scrap another layout today. This page is for Bons Scraps November Room of the Month challenge...basically you need to create a layout inspired by this picture. 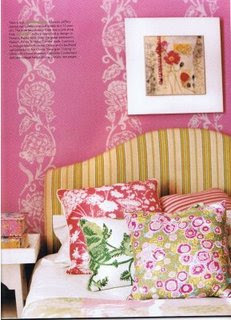 I used the pink, damask print, the vine in the cushion, the curve in the bed head, and the scattered cushions as inspiration. This is a page of myself and Celine Navarro, who I met at PACS in Italy. The line up of teachers for classes next year oh my....Heidi and Celine, and others too but I would LOVE to do a class with Heidi and well Celine's classes were just the best this year. Wish I could be going there again next year!!!!!! But oh well.....will be home in Aus. Supplies used: Pink Paislee Patterned Paper, Bisous Bzoo Patterned Paper, old book paper, Making Memories Alphabet Stickers, Pink Paislee Alphabet Stickers, Making Memories Postcard, My Minds Eye Bracket, Basic Grey Rub ons, Scenic Route stickers, American Crafts Remarks Stickers, rhinestones, ribbon, staples, black thread. Nothing else to add....looking forward to tomorrow night, 2 girls we met in Scotland are having a going away in Camden. Apart from that, nothing else planned, a nice cruisy weekend lets hope.